He joined in the demonstrations in Cairo's Tahrir Square, enduring a beating from Hosni Mubarak's forces while trying to topple a dictator. Mahmoud Salem's hopes for Egypt's future have everything to do with pluralism and economic growth and nothing to do with empowering Islamists like the Muslim Brotherhood. During an appearance Thursday at American University in Washington, Salem explained why he's confident that conventional wisdom about the Brotherhood is wrong, and its ascendance to power after parliamentary elections this fall is far from certain. "I'm not afraid of the Brotherhood," says Salem, who writes under the Internet moniker "Sandmonkey," and has a popular blog, Rantings of a Sandmonkey. "They are a minority." It may be more than wishful thinking. During a congressional hearing last week, witnesses who disagree about how worried the West should be about the Brotherhood seemed to agree that its political might may not live up to the hype. 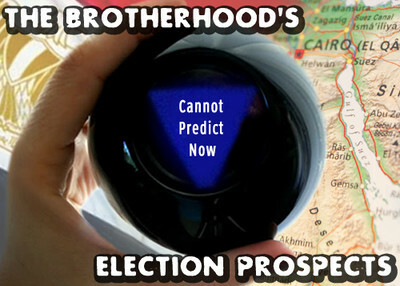 Brotherhood candidates won 88 seats in Egypt's 444-seat parliament in 2005. But that election saw a minimal voter turnout, Harvard University public policy Professor Tarek Masoud told the House Intelligence Committee subcommittee hearing. "Since the movement has never been put to a free and fair electoral test, any attempt to infer future performance from past results is risky," Masoud says. "But it is safe to say that in past elections, even in districts where the Muslim Brotherhood eventually won, more people generally voted against the Brotherhood (for candidates of the ruling party or for local notables) than for it." The Brotherhood was founded in Egypt in 1928 and with a primary objective of making society more Islamic in Egypt and throughout the world. Critics fear a Brotherhood-dominated Egyptian government would impose strict religious law, restrict rights for religious minorities and threaten the country's 33-year-peace with Israel. On Thursday, the Brotherhood's Deputy Supreme Guide, Mahmoud Ezzat, stirred up controversy after telling an audience in a Salafi-dominated section of Cairo that the Brotherhood sought to bring Egypt under the fold of Islamic law. "The enforcement of sharia [Islamic law] punishments will need time, and will only come after Islam is planted in every heart and masters the life of people, and then Islamic punishments can be applied," Ezzat is quoted telling the crowd. Statements such as these—especially when contrasted with other recent statements by Brotherhood leaders mollifying critics by claiming their intentions to support a moderate, free, and open civil state—have caused concern. Some harsh realities remain. The Brotherhood is the country's best organized, most affluent political movement and is adept at messaging. This is, after all, a movement known for its deception and doublespeak that has long showed an astute ability to navigate in trying political waters. For that reason, the United States needs to develop a clear policy for dealing with a Brotherhood-controlled or influenced Egyptian state, said U.S. Rep. Sue Myrick, chairwoman of the Subcommittee on Terrorism, HUMINT, Analysis, and Counterintelligence. "A lack of understanding about the group has lead to a classic case of government disorientation—we have heard the full spectrum of views on, and approaches to interaction with, the Brotherhood from various government officials, said Myrick, R-N.C. "This inconsistency makes me feel like our government is playing checkers while the Muslim Brotherhood is playing chess." During a February hearing, FBI Director Robert Mueller acknowledged that elements of the Brotherhood support terrorism. In that same hearing, Director of National Intelligence James Clapper drew flak when he described the Brotherhood as "a mostly secular umbrella organization." It is important to recognize the Brotherhood's true political objectives, said Robert Satloff, executive director of the Washington Institute for Near East Policy, in testimony last week. He spoke days after returning from Egypt to assess the situation since the predominantly peaceful revolution. The Brotherhood "absolutely tries to be opportunistic and offers a different face to different audiences," he said. It jumped on the Tahrir Square protests well after they were underway to capitalize and gain good will. Since then, the group has tried to soften its rhetoric about peace because "it does not want to trigger alarm bells in Washington." Today's rhetoric is not an accurate reflection on how the Brotherhood would steer Egypt, he said. Its core ideology would kick in once it attained power, when it "will almost certainly use that power to transform Egypt into a very different place." The United States should make clear that it can support a future Egyptian government that demonstrates a commitment to religious pluralism and free speech. One that offers an independent judiciary and upholds existing treaties and commitments. "Washington should project a clear message that it stands ready to provide such aid to a government that can endorse these principles and work toward their implementation in practice," Satloff said. "A Brotherhood-led, -guided or –inspired government of Egypt would not meet this test." Salem believes Egyptian voters will heed other appeals to pragmatism. In Satloff's example, more than $1 billion in annual foreign aid could be at stake. For Salem, the billions of dollars generated by Egypt's vital tourism industry – 11 percent of the total economy – makes increased theocratic policies a more difficult sell. The Brotherhood, he claims, "is getting weaker by the day." The Egyptian "people are quickly getting the point that they don't want to live in a theocracy," he writes. "Go to Upper-Egypt and talk to regular people, and they will tell you that they don't want the Islamists taking over because they want the tourists to come back." The Brotherhood thrived as the only viable alternative to a brutal ruling regime. To gain power in the post-Mubarak era, however, it needs a cohesive, unified platform of its own. "Internal divisions are ripping the MB apart," Salem writes in a recent blog post, with younger members announcing their intention to form their own group. The Brotherhood, he writes, is "out of touch with the public." That coincides with a public backlash over concerns about more radical Salafists, prompting the Brotherhood to try "to appease the public by declaring their party platform will call for a 'civil state' and will not have any conditions against women or copts running for President and thus in turn angering their own hardliners as well." If the Brotherhood is struggling, it may be for entirely different reasons, said Yigal Carmon, founder and president of the Middle East Media Research Institute (MEMRI). Carmon's organization closely monitors Egyptian media, and he sees the Brotherhood losing public support among those who backed the revolution due to a tacit alliance it struck with Egypt's army. In recent weeks, the army has cracked down on ongoing demonstrations, including the shooting deaths of two Tahrir Square protestors earlier this month. It also is cracking down on criticism of the army. Salem says that while many Egyptians are preparing for September elections and excited at the prospect of having an electoral voice, first on the list of post-Revolution priorities is to see former President Hosni Mubarak and his inner circle brought to justice. While acknowledging that it's best for the country to look to the future rather than the past, Salem says that he and others feel they cannot turn the page when a rock [Mubarak] is sitting on the page preventing it from being turned. Once he has been brought to justice, the sole focus can then turn to re-building Egyptian civil society from the ground up. Carmon, who previously served as counter-terror advisor to Israeli Prime Ministers Shamir and Rabin, agrees that the fall elections are a wild card that cannot be accurately predicted at this point. It is possible that Brotherhood candidates will win a plurality of parliamentary seats and that will help it to build a coalition which will write the country's new constitution. The need to form partnerships will force the group to continue softening its positions, Carmon said. But that would be temporary. He points to Turkey, where Prime Minister Tayyip Recep Erdogan came to power in 2002 after his party won about a third of the seats in parliament. His initial term was relatively free of Islamist emphasis, something that changed as he consolidated power. Now Turkey is moving consistently away from the West, warming relations with Iran and supporting provocative acts against Israel.